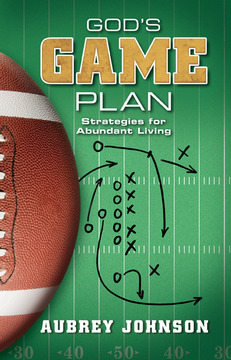 God’s Game Plan: Strategies for Abundant Living by Aubrey Johnson, Gospel Advocate, 2013, paperback, 144 pages, G56464, $9.99. Let me start by saying this is not a book about football. Although that prospect might excite some readers, it also has the potential to turn many away (especially those who, like me, tend to prefer a nap on Sunday afternoons in the fall). So the truth is, this is a book about spiritual growth using football to illustrate strategies to achieve this growth. Aubrey Johnson defines the ultimate goal of God’s Game Plan as living the “abundant life,” a term originating from Jesus’ statement in John 10:10: “I have come that they may have life, and that they may have it more abundantly” (NKJV). The bulk of God’s Game Plan outlines the spiritual disciplines that need to be adopted in order to achieve the abundant life. Johnson calls these “Growth Strategies” and provides 10: commitment, fellowship, Bible study, prayer, discipline, virtue, service, giving, evangelism and perseverance. Each “Growth Strategy” chapter describes, in detail, not only the strategy itself but also how it can be achieved. This book is simple, practical and personal in its approach. The language is down-to-earth, and although football names and terms are used throughout, they are explained clearly and do not over-complicate the text for those football fans who might be, shall we say, less than enthusiastic.